Aaron is an United States Professional Tennis Association(USPTA) certified teaching professional and widely experienced Bay Area tennis instructor. 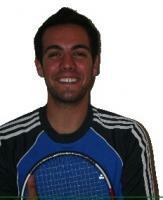 He has worked extensively with all levels of tennis students, from beginners to nationally-ranked players. He has taught tennis overseas, his most recent such stint being in the Bahamas. As a junior, Aaron was one of the top players in the USTA Northern California section. He believes it was his work ethic and desire played a big part in getting him to that point, and he strives to insill these same qualities in his students. Aaron's passion for competing and in bringing out the best from himself won him a tennis scholarship. He played collegiate tennis for the Cal Poly Division I Tennis Team, which was ranked in the top 75 nationally. All along, since his collegiate career until now, Aaron has remained involved with the USTA Men's Open Circuit. He is also a CPR, FirstAid,and Level I Sports Science certified professional. His interests are martial arts and traveling.